Payasam or kheer made with ada. The ada is made by adding water to rice flour, rolling the flour on leaves and then cooking by boiling or steaming. Once it is cooked, the ada is cut into pieces of any preferred size. Nowadays, readymade ada in packets, is available. Pour ghee into an uruli (traditional cookware), add the ada and mix well. Then add jaggery syrup of one-thread consistency, along with some sago and continue to mix. When the ada and the jaggery syrup have mixed well, continue heating till the water content has completely evaporated and then, add some coconut milk. Use the moonnam paalu (third portion of milk) for this. For half a kilo of ada, you need a kilo of jaggery and the milk of 5 coconuts. Grate coconut and take out the milk from it, by adding a little hot water and blending in a blender or food processor. This milk that you get the first time round is called the onnaam paalu (literally, the first milk); the second round of blending gives you the randaam paalu (the second milk). You can also squeeze out a third portion by adding a little extra water. When the sago has become cooked in the moonnaam paalu, and the contents starts to thicken, add the randaam paalu. Then, when it starts to boil and thicken further, add the onnaaam paalu and remove it from the flame. Mix in powdered cardamom. 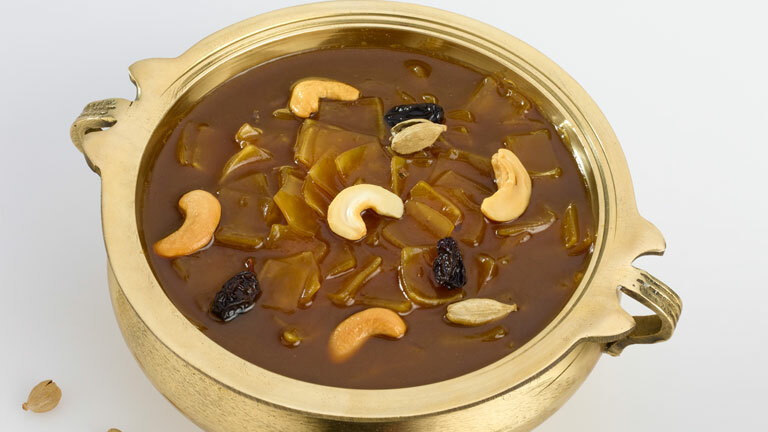 Garnish with raisins and cashew nuts roasted in ghee. For extra taste, add some thin slices of dried coconut fried in oil.